Clays also add color and design to cold process projects. 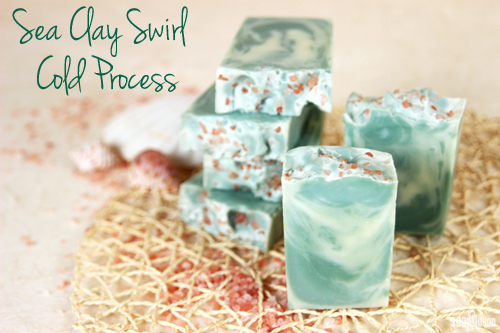 Sea clay, Hydrated Chrome Green and an in the pot swirl create a fluid look in the Sea Clay Swirl Cold Process Soap. Scented with Lavender and Cedar Fragrance Oil and topped with Pink Sea Salt, Medium, the soap is a natural beauty. 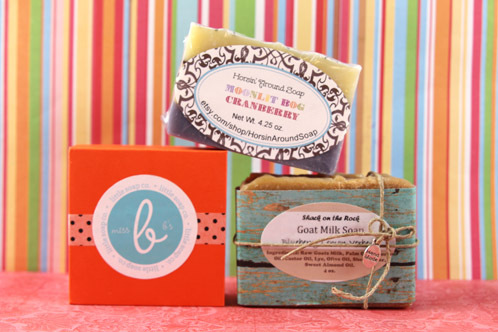 If you’d like to see the in the pot swirl in action, check out this Soap Queen TV video. Along with soap, clay is used for a wide variety of projects including scrubs. 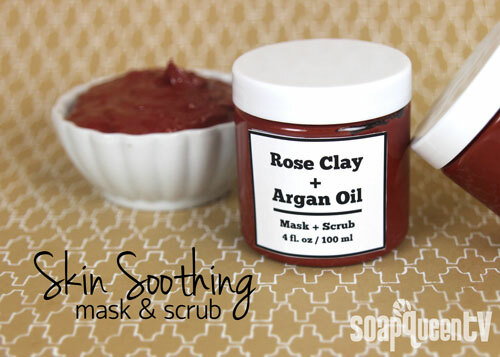 The Rose Clay Exfoliating Mask on Soap Queen TV uses a mixture of rose clay and kaolin clay. Made with argan and meadowfoam oil, the mask moisturizes your face while the walnut shells and clays gently exfoliate. Best of all, it’s quick and easy to make. Another versatile ingredient is cocoa butter. Cocoa butter is a hard vegetable fat with a chocolatey aroma. 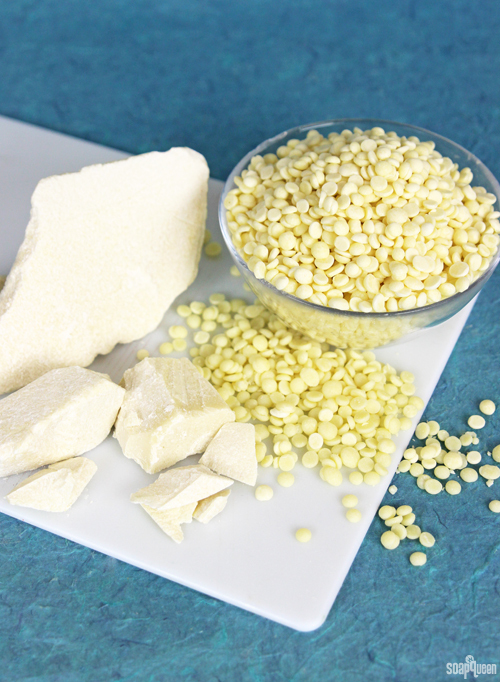 It has great moisturizing properties, and is used in everything from soap to body butters. Click through to read more about the ingredient and see several tutorials using it in the Sunday Night Spotlight: Cocoa Butter. Cocoa butter and clay are great to use in bath and beauty projects. If you’re planning to sell your products, it’s important to label them. Current FDA regulations require a home address on labels, which can be a personal safety issue for home crafters. A Citizen Petition was filed to allow PO Box addresses on the label. While that petition was denied, the FDA said the street address may be omitted from the label if the business name is listed in a current telephone or city directory, including online directories. Read more in the Update: PO Box Label Petition. It’s amazing what home crafters can create. 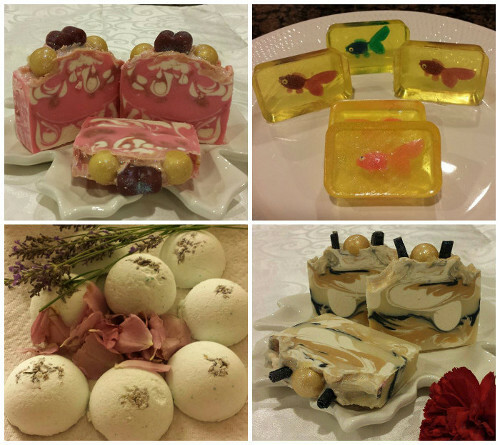 Check out these adorable melt and pour ducky soaps from this week’s Facebook Photo of the Week winner, The Fragrant Bath Boutique. 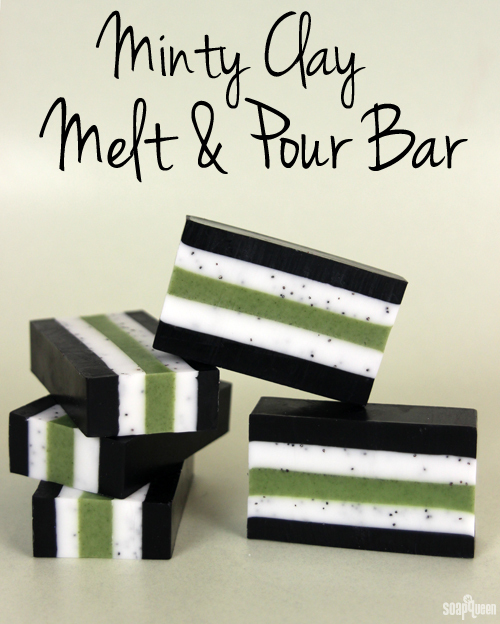 The melt and pour soaps feature green and white layers, soap scraps and of course, adorable rubber duckies. 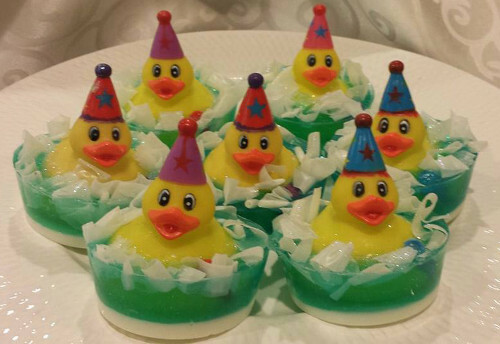 If you’d like to add some cute ducks to your soap, click through the Easter Ducky Soap Tutorial. You can also embed the ducks, as seen in the Embedded Ducky Soap Tutorial. Above (clockwise, top left) are The Fragrant Bath Boutique’s pink and white soap, embedded fish soap, yellow and white soap and lavender bath bombs. If you’d like to make some mondo bath bombs, click through the Tiger Stripe Bath Bomb Tutorial. Add a little sparkle to your bath bombs in the Sparkle Power Bath Bomb Tutorial. Next Post: Beautiful on the Outside. Moldy on the Inside.